Ok, I admit it, I’ve not watched a single zombie movie, nor do I care to. Whether this means I lack a sense of humor, a stomach for gore, a sense of play or all three, well, I’ll leave that for others to judge. In the meantime, given my lack of exposure to the movies, all I can do is guess at why the zombie craze persists and why it has remarkably come full circle; from horror movie genre, to a merchandising boom, to a live role-playing game, Humans vs. Zombies, played by hundreds of thousands of students on college campuses all over the world, and finally back to the cinema in the form of a horror movie based on the role-playing game. Even my own son wears a t-shirt bearing the “I ‘heart’ Zombies” graphic included here in this post…but then, he was born on Halloween. The family prepared in the parking lot. Chain mail and armor secured, they grabbed their weapons and headed into the old mental hospital. And then they smiled for the camera. It wasn’t your average family portrait session. But it’s exactly what photographer Jen Owen asked for her birthday, and her husband, Ivan Owen, happily obliged. “I guess it makes me a cool wife, instead of fluffy, frilly family pictures, to want to go kill zombies,” she said. More than just a day of photos with the Owens and their three kids, the zombie apocalypse shoot was a summer-long project, capped off with photos at the end of August. 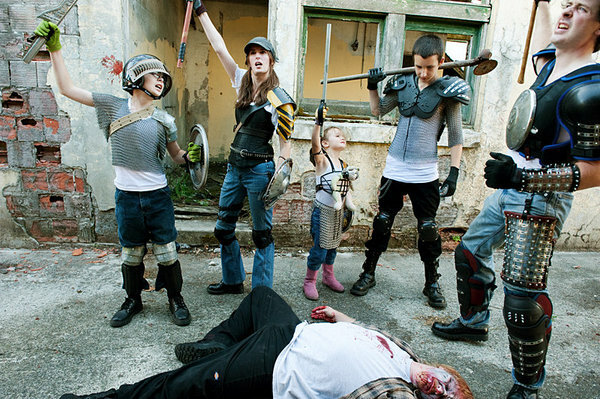 Ivan Owen is a salesman by day with a side business crafting chain armor, so while the kids were off for summer break, the whole family worked on creating their zombie slaying ensembles. Now, I don’t mean to ridicule the Owen family in any way. Like I said, their zombie family portrait seems bizarre…TO ME, meaning I clearly don’t understand the appeal of the whole zombie thing. But, in some ways, I wish I did, since the Owens and all those thousands of Humans vs. Zombies players very obviously are having a heckuva lot of fun. So, do dogs become zombies????? This is a very good question, Rumpy. Unfortunately, as I say, I don’t really have enough personal experience with zombies, so I can’t say for sure. That said, since dogs are evolved from wolves, and wolves no doubt would eat human flesh and brains if they were hungry enough, perhaps dogs would make particularly dangerous zombies. You are probably right, Chris. I guess it’s all about a community experience. That the community feels good imaginatively playing together is the important part, not that what they are imagining is a dystopian future where the undead roam the earth eating human flesh and brains. OK. Here’s why this Zombie craze originated and persists. It’s all about brainwashing the population into viewing other people as valueless meat sacks ready to be hacked apart in an emergency/martial law apocalyptic scenario. It’s about planting the kernel in the population’s subconscious that other people are potential enemies and savages that could threaten the lives of you and your family given the right circumstances. it’s about glorifying death and decay, making it cool, in a similar vein to the vampire fad. The Globalists/Illuminati are implementing a world government and in order to do that they’re destroying the current system in order to offer their new Orwellian Eugenicist global ‘Utopia’ as the solution. This destruction includes the engineered credit crisis, the removal of Western production and jobs, the Man made global warming scam designed to collapse independent energy particularly coal and squeeze more wealth out of the population…..Global gun disarmament and most likely impending world war involving massive intentional depopulation and the death of hundreds of millions via viruses, radiation etc. This sounds to horrible to be true but do the research, look at recent events and realise the truth. The zombie brainwashing serves to psychologically condition people to view others as enemies and reduce social cohesion in an emergency scenario and it also serves to increase paranoia and conditioning via constant suggestion that an apocalypse is imminent and likely, something the Globalists intend to bring about. I’ve never found zombies appealing at all but then i realised why, I’m not weak-minded like the rest of the sheep, I think critically, and thus have always found vampires and other supernatural creatures of high intelligence, supernatural strength and independent will to be appealing, after all who’d want to be a brainless corpse? Weak suggestible types who love to be part of the herd and fantasize about hacking up other people. This zombie thing was orchestrated, and like a Jedi mind trick, it only works on the weak-minded.